Feeder Fish basically refers to the type of fish usually considered unwanted (such as deformed fry) or those low-grade species mainly guppies and common goldfish which are bred specifically for the sole purpose of feeding to large predatory fish especially oscar and arowana. Although it is often used as an added supplement to provide that extra nutrition, using live feeder fish has its downsides, which I do not recommend. Using live feeder fish is often frowned upon as a cruel act that inflicts pain and suffering to the other fish. Although there are certain people who find it interesting watching as the larger fish hunts down the smaller and much inferior prey, I don’t feel there’s anything exciting about it. Most of the time, feeder fish are swallowed alive giving it slow and painful death as it meets its end in the belly of the predatory fish. As a pet lover, I hate seeing the kind of treatment inflicted on other creatures and as such I’m all against using feeder fish as live foods. 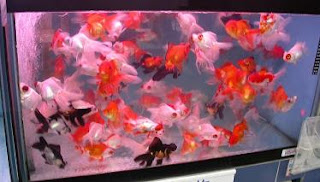 Other than that, using live feeder fish also comes with its risk. Unless you buy your own stock and breed them, the feeder fish, which are found in aquarium stores are usually grown and bred in small containers. Most of the time, the overcrowded condition often led to poor water quality and because of that, the fish usually carries with it various aquarium fish diseases such as fish lice and anchor worm. When fed to your larger pet fish, you risk introducing the disease as well and such it is not a wise option after all. If you need to ensure that your pet fish stays healthy and get the best nutrition, there are different options around such as using combination of high quality flakes and pellets. Once in a while, I will also consider adding frozen bloodworms and daphnia to provide that extra supplement. Remember, you always have a choice.